Classic Cartoons: "Room and Bored"
Andrea/Duck Dodgers here. I friendly welcome every fan of animation at my blog. 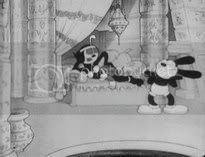 The goal is to support the love and rediscovery of Classic Theatrical Cartoons from the Golden Age of Animation, keeping meanwhile an eye on Golden Age "Funny Animals" Comics as well as on modern animated productions! Every SUPPRESSED ethnic caricature to be sometimes presented here is just for HISTORICAL and EDUCATIONAL purpose and NOT to offend anyone. Stay Tooned and Enjoy the place ! "Room and Bored" is my favorite Fox and Crow cartoon. It seems as Wickersham was really living and eating Fox and Crow (them and thanks to) 'cause not only he directed some of their best shorts, he was also the artist behind their first comic stories, as you have already seen on this blog. This' one's a classic. The contrast between the two never was and will be better, being the Fox a lover of classic music, a gentleman that loves quiet and rest, Sherlock Holmes-like playing his violine, wearing a pinafore through the whole short, and the Crow a jitterbugging jazz-loving "pest about town". The Crow is indeed a bit reminiscent of Jim Crow of "Dumbo" fame (I love the way he looks in this short) and, yes, you fans of unPC moments, there's even space for a pretty WW2 reference. Daffy VS Curly: "Woo-Hoo" against "Woo-Woo-Woo"
"Wait right here, Foxie! I'll be right back!"